The Zero Line is the place where the water meets the shore and the starting point for building your own maps. Included with the AutoChart PC software is a 32 GB map card loaded with Zero Lines for millions of water bodies in North America (excluding Alaska). With these all-important Zero Lines as your foundation, you can begin creating your own, accurate and detailed maps of any fishing spot, even where contour coverage doesn’t exist. 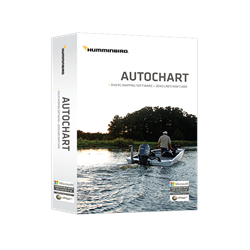 Once your AutoChart map is created, the only way to view the contours on a compatible Humminbird fish finder is by loading them onto a Zero Lines Map Card. Get on the fast track to finding fish more effectively. Humminbird AutoChart enables you to use Minn Kota® i-Pilot® Link™ on previously unmapped bodies of water after you create contours with the revolutionary AutoChart PC Software. The i-Pilot Link’s innovative Follow the Contour feature will direct the trolling motor to follow a specific depth contour. The chosen contour line can be automatically followed in either direction, or stay a set distance from that contour or shoreline with Contour Offset.